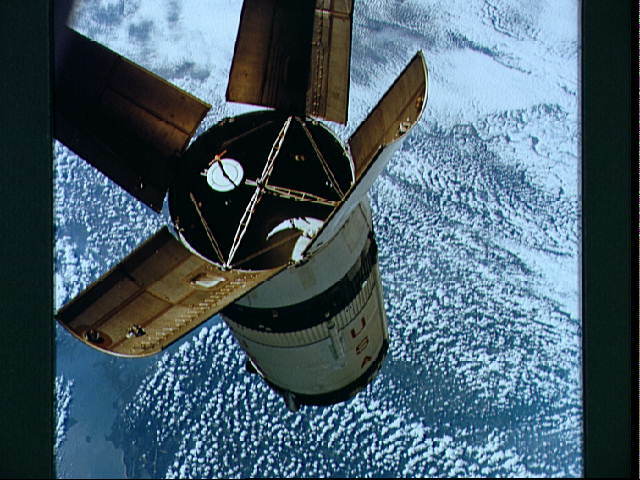 The expended Saturn IVB stage as photographed from the Apollo 7 spacecraft during transposition and docking maneuvers. St. Louis Bay and Lake Borgne area just east of New Orleans is seen below. The round, white disc inside the open panels of the Saturn IVB is a simulated docking target similar to that used on the lunar module for docking during lunar missions.